After reading that putting Autistic children on an electrolyte solution may help with their digestion, we went ahead and did some research to find a natural electrolyte. While searching on the net, we somehow landed on the Thriiive summit website. The summit was held in September this year and one of the issues they talked about was dehydration in autistic kids. I found some electrolyte recipes, and one using green Coconut water particularly appealed to me because I love it. It may actually be one of the best choices for an electrolyte because of the presence of various nutrients. We also learnt that an electrolyte drink is important when undergoing a detox programme. 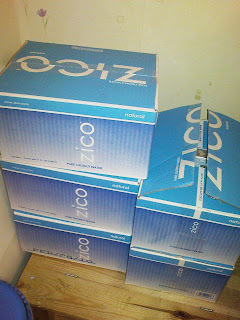 Anyway, we found this brand called Zico and bought 5 cases containing 12 packs of 330ml each from a company called Live Longer and Healthier.co.uk. It cost us a total of £89.99. I think it's worth it for 60 packs of pure coconut water.